Extended Learning Opportunities (ELOs) allow New Hampshire students to earn credit through learning experiences that happen outside the traditional classroom. Many but not all NH high schools offer ELOs at this time. Explore our Beyond Classroom website to see ELO samples and learn much more about setting up an ELO program. If you want a quick introduction, watch the 15:04-minute video below, “Students at the Center: Extended Learning Opportunities at Pittsfield Middle High School.” Pittsfield is about a half-hour northeast of Concord, NH. 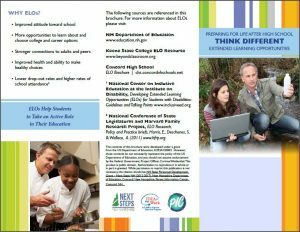 The New Hampshire Extended Learning Opportunity Network (NHELON) is a collaborative of ELO Coordinators, teachers and other educators. This network is interested in advancing the implementation of ELOs throughout the state. All are welcome to attend the monthly meetings. For information, contact Donna Couture or Terrill Covey. 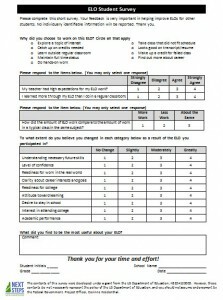 Collect data to track the success of your ELO program with surveys for teachers and students.